DoorBird stands for the combination of exclusive design with the most innovative IP technology in the field of door communication. It is made from corrosion-resistant precious metals and manufactured in Germany according to the highest quality standards. The design is sophisticated, clean and straightforward. Just like the name suggests, DoorBird is like a bird protecting your home and alerting you when anyone comes to the door. 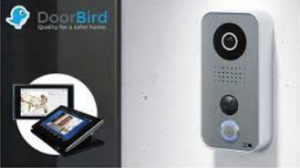 DoorBird provides you comfort and convenience, allowing you to safely monitor and remotely open your front or back door. DoorBird is the best method to protect both you and your loved ones. DoorBird showcases 720p HD video quality, and two-way audio communication, making it easier to communicate with the people who ring your doorbell. There is a 180-degree viewing angle, which makes sure that every area of your driveway can be seen at once. Through the mobile application and Html5 web application, you can check who is at your door from anywhere around the world. Motion sensors can help alert you whenever someone comes to your doorbell, ensuring maximum security for your household. With the 12 infrared LED lights in the design, you can see a distance of up to 26 feet at night. With an elegant, straightforward design made of high-quality precious metal casings, it works very well with modern and contemporary houses. It comes in multiple surfaces, such as bronze, titanium and steel, and your own choice of colour. The only downside… all the bells and whistles come at a price. If comfort, convenience and home security are key, then DoorBird should be an option to consider.